On May 16, 2015, Sussex Christian School held a rodeo as a fundraiser. SHARK sent an investigator to document the event. This steer was clearly stunned after having his head twisted to an alarming degree. 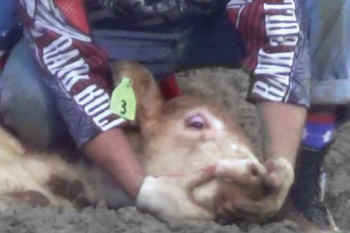 Contact the Sussex Christian School and ask them to never hold a rodeo again as a fundraiser. The money they collected is stained with animal cruelty. On the weekend of May 16 and 17, there were two cruel rodeos in New Jersey. The first rodeo was a fundraiser held by the Sussex Christian School, a private religious school in Sussex, NJ. During the bulldogging event, rodeo contestants brutally threw the animals to the ground and twisted their necks violently. The saddest aspect of the rodeo was the calf roping event. The calves used are babies, just a few months old. They are innocents, and they were brutalized so that the Sussex Christian School could collect money. What happened at the rodeo was animal cruelty. What the Sussex Christian School did by holding that rodeo was hypocrisy.